The Simple Life of a Queen: Lazy, No, Busy Day's of Summer! Lazy, No, Busy Day's of Summer! Happy Hot Summertime in Washington. We've had some really hot weather since our return from Nebraska. Some of that time has been at the lake but some at home too. Last weekend our son Jamie and two of our grandchildren came to visit. They arrived early afternoon Friday and left Sunday morning. We spent all day Saturday at the lake where they went boating and swimming. By request, I am no longer posting photos of them. Suffice it to say, they are absolutely wonderful kids, both inside and out. They are so polite and thoughtful and we had a wonderful time. It is always so hard to see them leave because visits are few and far between. 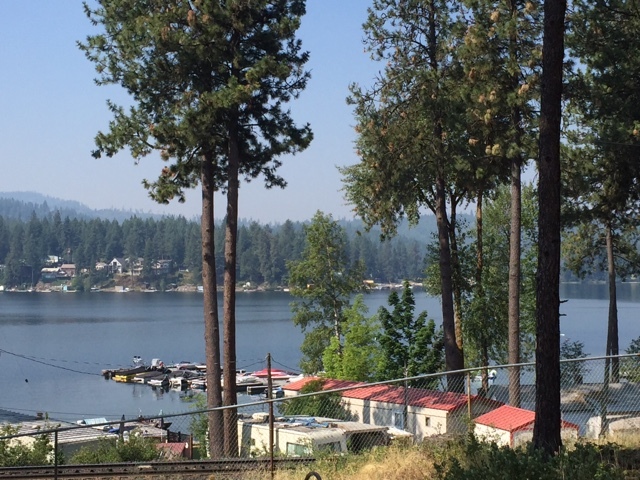 Then yesterday Alicia and her boys drove to our lake place from their home in Moses Lake, WA. It's about a 3 hour drive. Kale and Hayden are about the same age as our grandchildren and they treat us like grandparents which is really sweet. They swam all day, (literally in the water for 5 hours straight! ), and then we came home and grilled hot dogs and hamburgers and had watermelon and macaroni salad. Yum! Then we watched the new Beauty and the Beast movie which was wonderful. They spent the night with us at our house and then left this morning to do some school shopping and a doctors appt. They may be back the weekend of July 29 with their Dad. Dennis is preaching that Sunday and they want to go to church with us. Dennis baptized both Alicia and Jeremy and also performed their wedding. Alicia worked for me for a number of years when I was a bookkeeper. They are a really sweet family and we enjoy having them for visits. You may remember that they had Thanksgiving with us last year. Here's a somewhat smoky view at the lake yesterday. The smoke is from fires in Canada and also across the Columbia River in Washington. Nita's flowers are thriving. 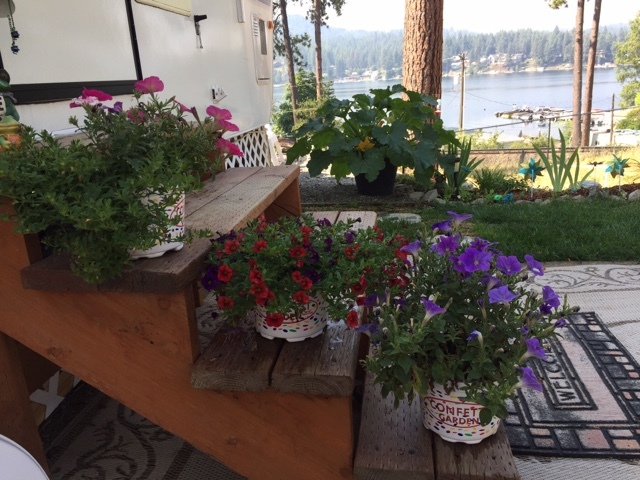 She hasn't even been at the lake for almost a month but Lori takes good care of the watering for her. 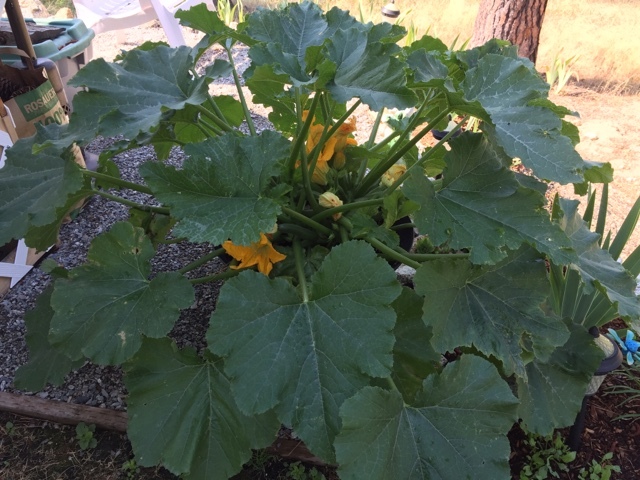 Nita's container zucchini plant. Again, Nita planted the seeds and then Lori took over. Look at all the blossoms! 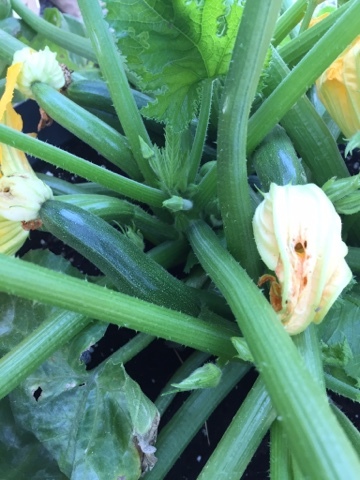 There are lots of little zucchini's in there. Can you see them? Chloe and Maddie. They are such great friends and really miss each other in the winter. We're doggy sitting Maddie this weekend while Paul and Lori go canoeing and biking the "Trail of the Coeur d'Alene's" in Idaho with some other friends. Last weekend we had Sophie. I think I should hang out my shingle as a dog sitter! 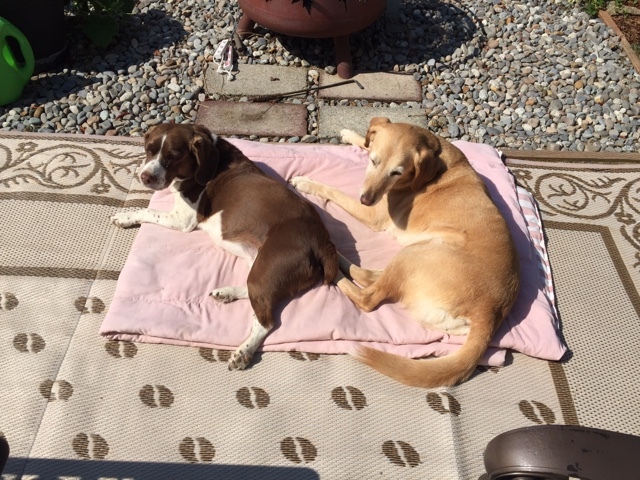 Both Sophie and Maddie are very easy to care for and all three dogs love each other. Larry and Nita are camping in their motor home on the Columbia River in Oregon until Sunday. They just arrived this morning and Nita sent me a text saying she should have left Sophie with me. There are a bunch of other dogs at the campground and she's so little she's scared to death. We would have had all three dogs if they would have left her with us! 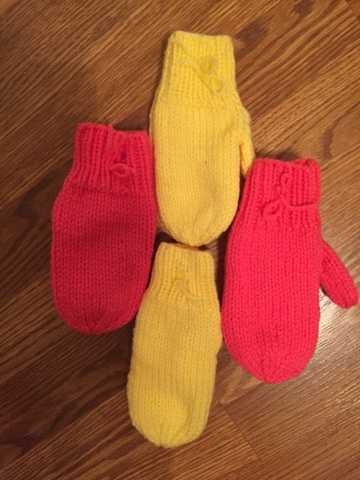 Only four pairs of mittens were done this week. I have been busy with company all week and not much time to knit at all. Kale and Hayden have asked for socks so I need to get busy with those too. 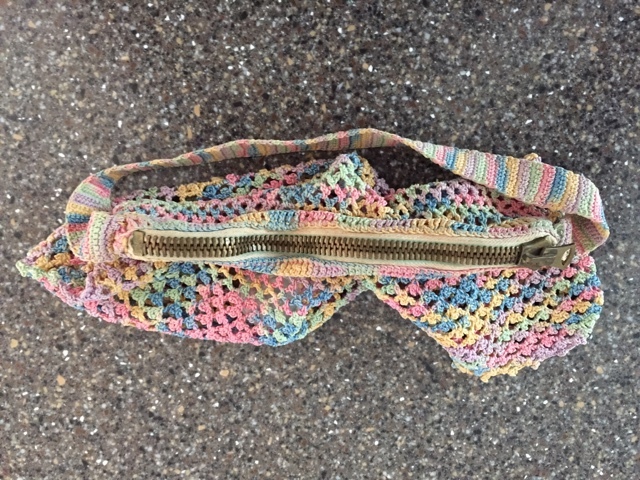 This is the little purse my grandmother crocheted way back in the 1800's. I keep it in my cedar chest to preserve it. The stitches are the tiniest I've ever seen. The hook must have been a "0". The thread is just that...tiny, thin thread. She was about 8 years old when she crocheted it and the workmanship is so perfect it's almost unbelievable. She even put a zipper in it...perfectly. Look at those tiny clusters! I remember her telling me that her grandmother made her do it all by herself with no help so she would learn to do it right. She's the one who taught me to crochet and I'll forever be grateful to her. I miss her. She taught me so much about sewing, yarn work and cooking. 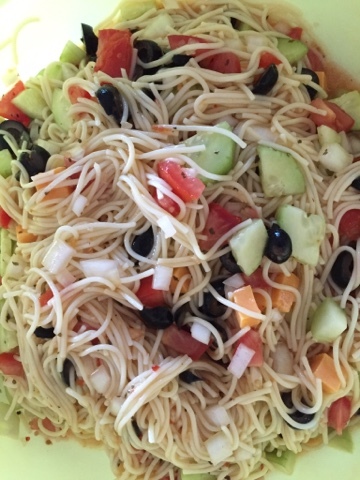 I made a spaghetti salad this morning for a luncheon I'm going to tomorrow. It's best if it sits at least a day to let the flavors marinate together. Doesn't it look good for a hot day? My English Rose bush bloomed this morning for the first time this year. Usually it's around the 4th of July so it's a bit late this year. I just love the gorgeous lavender color of these flowers. Well, I think I've bored you enough today haven't I? Life is in it's round of lake time, company time and home time. I still haven't gotten into the water at the lake, but that's my plan for Friday! I have my floaty inflated and I'm going to enjoy myself. I hope you're all having a wonderful summer, (or winter if you're down under). May God bless each and everyone of you. I'm SO thankful for you being here to visit me. What a fun and busy time you've had! So happy that you're up to having company and enjoyed company of friends and family. Your purse is so pretty. The work looks like doilies that were made way back then. I've got one in that color. Megan's been house sitting for friends and their dogs while they're on vacation. It helps her out moneywise and we get a quiet house for a few days. We've had warmer weather as well. Mid 80s lately. Need to water our lawn. Take care my sweet friend! Hugs!! Ah, busy plus dear sweet sis, so glad your saw your family, my family also don't allow any shots of their family online... so don't ever do it. Am glad to see your shots sis they never ever bore me. I learnt to crotchet with sewing thread, yes that's really really thin ultra fine like an 80 count thread. Can't recall what size needle it was. My mums friend was visiting us and she taught me to do an edge around a hanky, I was about 13 or 14. I finished it and still have it, haven't done anything that fine since, but did some 80, I think it bit thicker. I generally use 20 count, or at least 40. Eyes aren't what they sue dto be. Think that's what you need to think when looking at Grandma's work. Also when that young you don't have anything to compare it with so expectations are different. Love Nitas garden so pretty. That little purse is darling! I want some spaghetti salad now. It looks delish! What a fun and news filled post. I'm glad you've had the opportunity to travel and to have company at your home and the lake, too. Enjoy your relaxing day, floating in the lake. Life is good. The flowers are so so lovely. I love overflowing flowers this time of year. I had to cut some of mine back due to legginess. I LOVE your heirloom crochet purse. Oh so special! Always fun to hear and see what's happening in your neck of the woods sweet friend. I love the purse your GrandMother made. 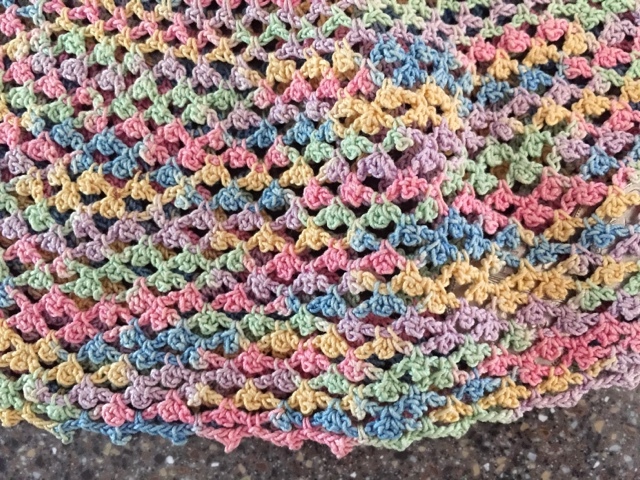 Teaching someone to crochet is truly a gift for a lifetime. Love all the photos. Wishing you a lovely day sweet friend. Blessings always. 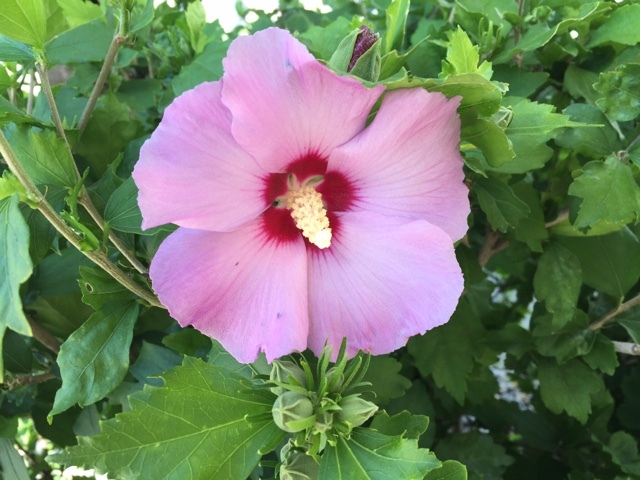 I agree-the flower at the end is in the Hibiscus family; pretty now matter what! Nice needle work as always! Sounds like you have been so busy with all of your wonderful visitors Betsy. That bag is priceless. Oh, my word! 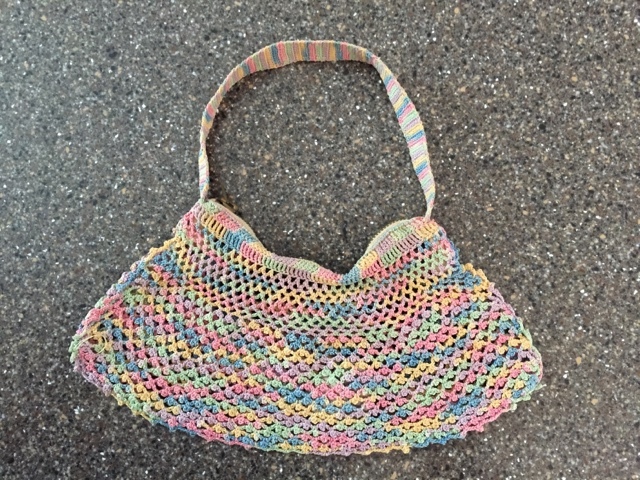 That purse your grandmother crocheted! And, at 8 years old! What a dear lady she must have been...I can see why you would miss her so much. Such precious memories, indeed. And, dear friend, you are NEVER boring! I savor your posts...I save them in my inbox until I have time to sit down and really read them and absorb them. They are always a dear blessing to me, and I always leave here uplifted in spirit. May the Lord bless you always for all you do and the blessing you are to me and to so many others. How wonderful to see all your Grandchildren in such a small space of time. I know how you are feeling I am planning to go down to help out with the childcare for 2 of mine and then will call in on the others whilst we are in England. Exciting times. The purse is a delight Betsy, such a talent from someone so young, a beautiful family heirloom. It sounds like you are having a wonderful summer! YOur mittens are so sweet and the purse is unbelievable! I can't crochet that good and I've been doing it for years! LOL! I didn't know they had variegated yarn/thread back then...amazing work and look at the zipper! Thank you for sharing that and how wonderful that you have that from her and your wonderful memories too. What gorgeous lake views you have! Happy Summer!